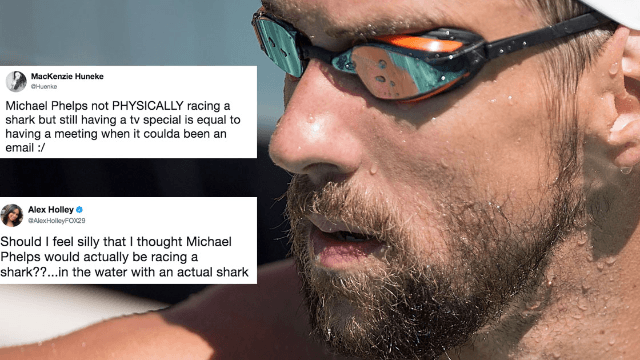 Michael Phelps didn't literally race a shark and people feel really, really cheated. In today's most predictable news, the internet is furious that Michael Phelps didn't actually, truly, line up side-by-side with a shark in a swimming pool and somehow motivate it to race him to the other side. On Good Morning America, Phelps had tried to tamper down the expectations set by the Discovery Channel, saying "We're not in the water at the same exact time. I think that's the one thing we all—we want everyone to know—I was safe..."
Good Michael, we all want you to be safe. But the trailer definitely implied some live Phelps vs. Shark action. According to The Guardian, "the shark was in-fact a computer simulation rather than a actual great white but its swim speed was calculated using data collected from the real thing." No one loved that. Phelps ended up losing to the "shark" by two seconds in a 100 meter race.